This quilt was made for my middle daughter's kindergarten teacher, who was retiring (uh.. no cause and effect relationship there!). Jane Kowalski was the most incredible, wonderful teacher any parent could ever hope to have for their children. She was one of those gifted teachers who made learning fun, encouraged her students and fired their imaginations. The elements of your wall-hanging were not chosen at random! In the central square, the four corner blocks are "Little Red Schoolhouse". Although each is red, the pattern on the fabric is different, representing the different schools at which you have taught. 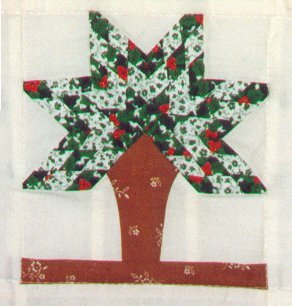 The center block is a pattern called "Peony", which I modified to look (I hope) like a stylized oak tree - the symbol of Walnut Creek. The remaining four squares have "apples for the teacher" stenciled on them. Surrounding the central blocks are two borders, which have K-Bears in the corners. Each K-Bear has a heart on its tummy. Next are the signatures of your 1994-1995 K-Bears from Indian Valley. Each K-Bear very carefully wrote his/her name. Some were rather ... creative! Underneath or above each name is a stenciled K-Bear and a heart. Your K-Bears love you! In the corners of the signature blocks are motifs that represent the subjects you have taught: reading, writing and arithmetic; the love of reading and artistic effort. The outer border is a pattern called "Flying Geese". You said that you wanted to travel during your retirement, but notice that all the geese are flying in the same direction. This ensures that you will not become lost during your travels and will safely return home to those who love you. The reverse side of the wall-hanging shows all the people you have touched, encouraged and inspired all your life. You will notice that all of these people have one thing in common: they are all smiling!! I hope that this wall-hanging will remind you of the wonderful times you've had at Indian Valley and of the people who will miss you greatly. 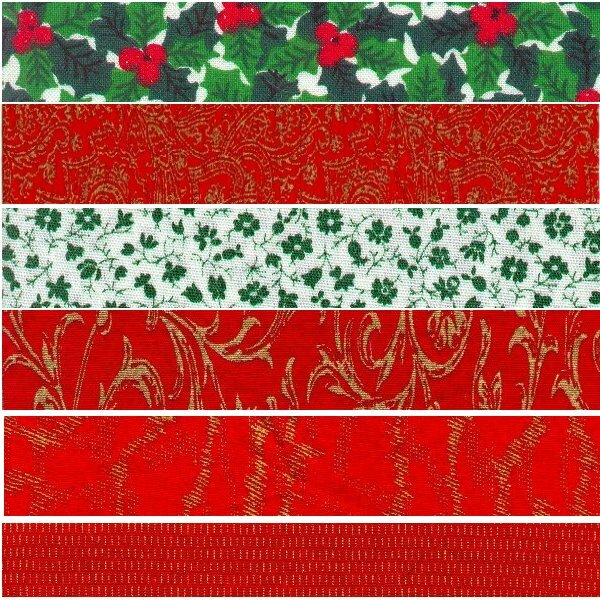 Here are samples of the red fabrics used in the four schoolhouses and the two green fabrics used in the oak tree. The rest of the fabric was off-white cotton plain weave. The backing was a collage of lots of smiling people (unfortunately, I no longer even have scraps of that fabric). The off-white, one of the reds and the dark green were used in the construction of the Flying Geese. It was bound around the edge with the dark green. 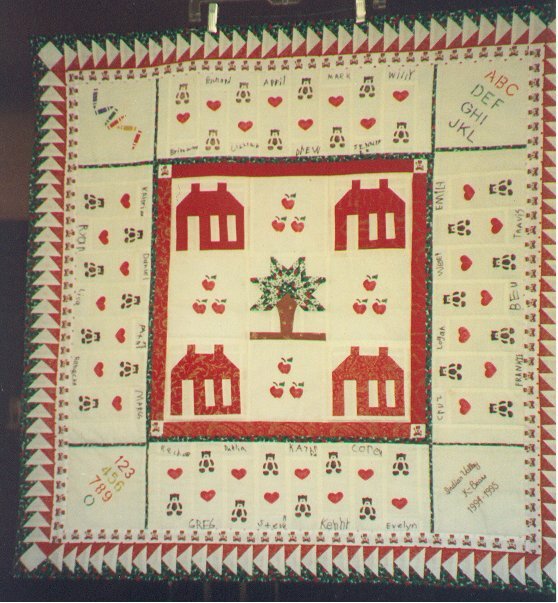 I enjoyed making this quilt, as I stenciled the K-Bears, hearts, apples and 3 of the corner motifs .. a technique I had not used before in quilts. In the lower right corner, I hand-embroidered "Indian Valley K-Bears 1994-1995". The trickiest part was getting all the kids' signatures without Jane being aware of it. Fortunately, I was also the class' computer lab instructor. The lab was in a physically different classroom. Half the class would do computer lab while the remaining half had concentrated time w/ Jane. After 1/2 hour, the two halves would switch. So, it was during computer lab time that I had each child print his/her name on a stablized piece of the off-white cotton ... and had them PROMISE me that they wouldn't tell Mrs. Kowalski! It was a great secret they had to keep until I brought the quilt into the class to give it to her. To my knowledge, all the kids kept quiet!